Is it possible to transport one’s sensibilities back to the experience of learning how to walk? I feel like I have done so this week. Several weeks ago, one of my knees decided to rebel against me. I kept functioning as usual, so far as daily activities—and running—goes until I could not do so any longer. Finally, a week ago, I admitted that I had to stop running; it has been so very humbling to realize just how hard this has been. The downside, I suppose, to being trained for a marathon, is that not being able to run those long distances anymore . . . not being able to run at all—has left me jumping out of my skin in an itch to move. Some research into the symptoms led me to peg the pain on a common long-distance runner’s ailment known as ITBS. From what we’ve been reading about it, it can heal itself naturally, but does require enough time off to at least start the healing process. Stretching is also crucial. Both of these two things—time off and stretching—are, I must admit, not customary for me. Thanks to a supportive husband, however, I have an in-house physical therapist these days. I also have a sounding board to help fend off my tendency to overthink, and so brood, over anything I feel is amiss in my life. Getting to teach Grade One P.E., for instance: I have been on a high over the possibilities, after working on a lesson involving basic motions combined with upbeat music so as to “dance” in a way that helps young bodies learn direction and coordination. The weather has also suddenly, drastically, improved. After being housebound by the cold and precipitation, this week of bright sunshine has brought us back outside, soothing nerves and lifting spirits. This week the elementary classes celebrated the 100th day of school. 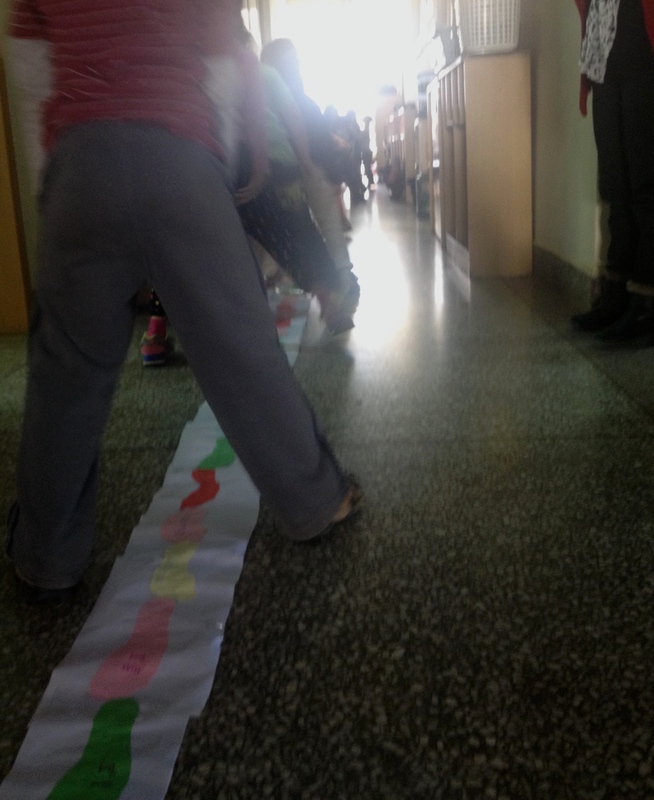 As a part of it, the kindergartners created a banner of their footprints. Baby steps . . .? In a strange sort of irony today, I was asked for book recommendations to help a young one about to transition from here (home) back to the United States (parents’ home). She explained that the child’s teacher had asked her to help, after the teacher and parents had noticed some unhealthy fear that seemed to be stemming from the pending move. I told the woman that I remembered my own walk through transitional grief, at around the same age as this child. Even though I had some other traumas coming into play, in addition to the move, I do vividly recall the confusion brought on by the move from the country I knew as home to a strange and unfamiliar U.S. I also recall taking comfort in the books I read. I told her that the Chronicles of Narnia had provided me with a beautiful fantasy world that I could “escape” to when reality was just too much for my young sensibilities to process. I shared how other books [such as Where the Red Fern Grows, Missing Mae, and Out of the Dust] had allowed me to identify with a grieving character, so that I could weep along with a fictional person for the very real people that I had lost. I also suggested that books such as A Little Princess and The Secret Garden may help by providing a young heroine to identify with who was dealing with similar transitions. After talking for a bit about these titles, along with a few others, I admitted that I was probably not offering the expected sort of “therapy” titles that she had been told to look for. I know the series of board books that were marketed as such: titles listing behaviors children should avoid and attitudes they should aspire to have. I also admitted that the books I was listing were probably above the target age range, and perhaps too long to lend themselves to an easy one-time chat with a child. But I just couldn’t help being wary of overly didactic, expected types of material. I also happen to believe that high quality literature can reach a much broader age range than some people seem to think . . . and that children are able to see through a lot of conventional grown-up assumptions. So I went with my gut. As it turns out, my gut response turned out to resonate with this woman. A mother of TCKs herself, I guess she may have observed some of the same things I had experiences. Who knows what the outcome will be for the child in question: but I like to think that the stack of books I checked out today will resonate, in some positive way, in a young one’s heart.